From their cover of Heatmiser's "Not Half Right" (improperly labeled as "Half Right"), an Elliott Smith song (it would have been cooler if they covered a Neil Gust/Heatmiser song, but...). To the four other tracks on the Stay On My Side Tonight EP. Jimmy Eat World prove that, even though their last record failed to capture the multi-platinum success of Bleed American (a near-desert island disc, if you ask me), that they still write vital, potent songs. "Not Half Right" doesn't stray much from the original (a 'hidden' track on Heatmiser's final album, Mic City Sons), but Jimmy Eat World still do it quite well and manage to make it their own. "Disintegration", the album's opening track, finds the band taking chances, delivering a slow-moving, emotionally-ripe, nearly eight minute epic pop number, while "Over" sounds like more traditional J.E.W. Then there is "Closer", a mid-tempo emo-pop song that will instantly dig into your heartstrings. 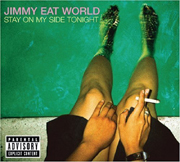 On Stay On My Side Tonight Jimmy Eat World go straight for the emotional jugular, toning things down a notch or two, and allowing you to fully absorb the heartfelt words that runs through these songs. It's only downfall, it begs for Jimmy Eat World to really let loose and hit you with a punk-inspired song. But, as a prelude to their next full-length, maybe they got their softer side out here and will rock out on it. At any rate, this is solid through and through, and when the band does rock out on this album (it has its moments), they sound untouchable. I'll give it a B.